GEISLINGEN/STEIGE, Germany – For WMF customers, innovation is the expectation – and it´s why we use innovative technologies, comprehensive function packages and convenience in any application. That’s all thanks to the new WMF 5000 S+ speciality machine from the Geislingen-based coffee machine manufacturer. In showcasing the new fully automatic machine at Internorga 2019, the company is now also able to deliver its unique digital solutions packages as standard to customers in the performance class that caters to upscale coffee requirements – and all of this in combination with a world premiere for a machine that will be introduced to the general public at the spring trade show. 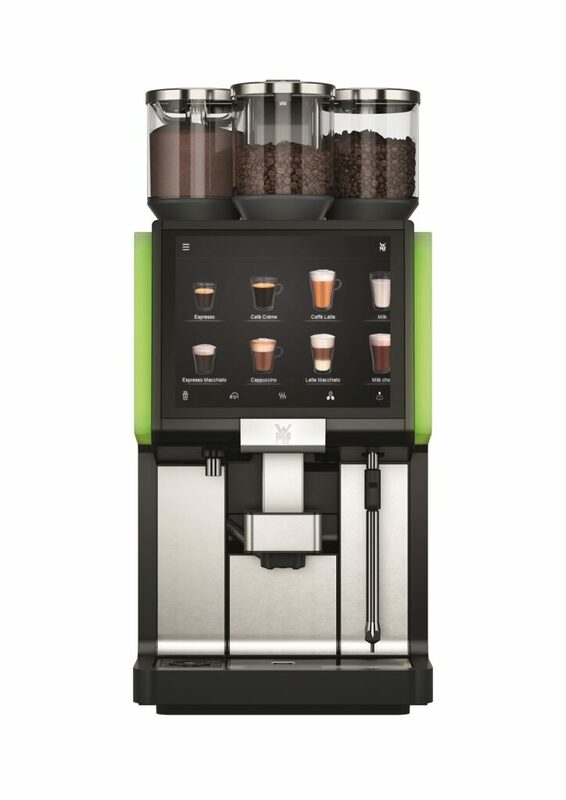 As well as a 10-inch touch display which supports both video and audio output, sensor-controlled automatic cup height detection and high-performance preparation of coffee and hot tea in parallel (a feature supported by all 400 V models), this premium fully automatic machine also impresses with self-regulating connected technologies. To ensure delivery of consistent coffee quality of the highest level at all times, the WMF 5000 S+ monitors its own operation and will automatically adjust its machine settings if necessary. The technologies developed to make this possible include Dynamic Milk Assist for perfect milk management, Dynamic Coffee Assist to ensure the consistent quality of all espresso-based coffee specialities and the telemetry solution WMF CoffeeConnect. The WMF 5000 S+ also features a revolutionary technology concept that will be making its debut at Internorga 2019. Visitors to the trade show are bound to be impressed by its ability to merge and optimise two very different approaches to making coffee in a single machine. Recommended to suit an average daily requirement of 250 cups and with dimensions of 32.5 cm x 59 cm x 71.6 cm (W/D/H), this premium fully automatic machine is able to provide an outstanding digital coffee experience even in situations where space is tight. With two bean hoppers available (700 grammes and 1100 grammes capacity), plus a powder hopper (accommodating 2000 grammes) and a manual insert for ground coffee, users can let their creativity run wild when devising coffee recipes. Every quality parameter – water, milk, coffee, chocolate or the addition of syrup – can be managed easily using the touch display. Users can access various template options and special functions, including a touch slider for customising cup volume. The fully automatic machine also has an adaptable look and feel, with the colour scheme and the language both easy to change. Another convenient feature is the ability to access handling videos, nutritional information and promotional offers.